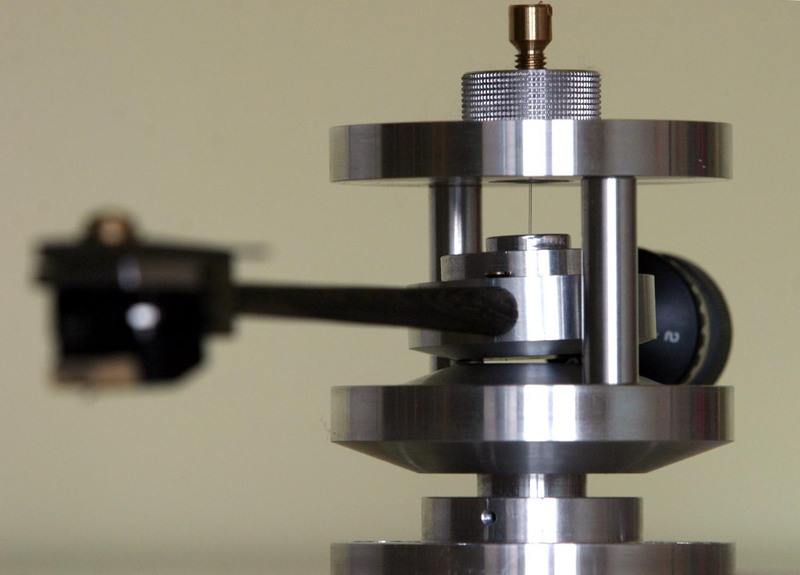 Magnetico was the first diy tonearm ever build, with superb unexpected results. The gap between the magnets is about 0.2 – 0.3 mm and it is adjustable on the fly. Also, adjustable is the torque tension in wire, and it depends on how much the wire is twisted around it’s own axis. This adjustable tension serves as bias adjustment – aka anti-skating force tuning. The wire retainer piece (made from brass in the upper left picture) is threaded and permits the gap between the magnets adjustment. The wire retainer is supported by a thick threaded washer (immediately under the brass retainer), which rests on top plate of the arm support assembly. This washer could not move laterally , but could be freely turned around it’s own vertical axis, thus allowing to adjust the torque tension inside the wire. The lower magnet is captured in the lower plate of the arm support assembly. The upper and lower disc plates of the arm support are linked by two vertical side rods, hold in their places by screws. The lower side of the lower plate has a termination which fits the mounting flange, allowing vertical adjustment for the VTA , two screws blocking the tonearm in position after VTA was properly set. The mounting flange could be attached by any turntable with four screws. 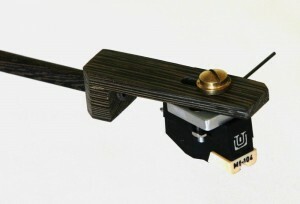 The tonearm wand was crafted from wenge wood (I liked how it sound, compared to other materials), as well as the cartridge holder. The counter weight was finally made from brass and decoupled with a teflon washer. The tonearm was tested with superb results with simple MM cartridge from Audio-Technica AT 101 EP, and later on with AT 440 MLA. The sound was good, but never tested this tonearm with top cartridges. The fine adjustment for the gap and anti skating was hard to get, and with random results. I should modify the design to tackle these problems, but I concluded the experiment and step for another tonearm design. Still, this kind of tonearm has a great potential for diy enthusiasts. My design resulted so bulky because I was not able to spot at the time a proper pair of strong magnets ; my only chance to finish this project was to use two big, heavy and no so powerful magnets- even so, the project was a success considering the amount of time invested in it ! Another observation is that the anti-skating adjustment ( aka the adjustment of the torque into the wire) does not properly compensate the skating forces variation across the arm trajectory . I find this a major drawback of this kind of design 🙁 .